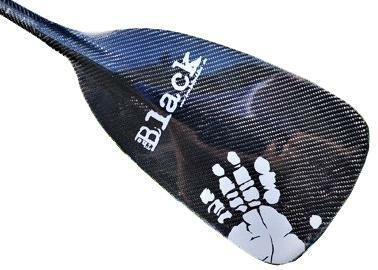 The Black is Freefall's finest carbon canoe paddle. 100% carbon, no filler, glass or dyed fabrics. One piece construction of the blade and shaft ensure the strongest bond, no shoulder to snag, and consummate aesthetic beauty. Specifically designed for the modern Whitewater OC1's and rafting, the black has a wider, shorter blade than traditional open canoe paddles, giving greater power in shallower features. A flat rolling plane on the rear face improves recovery strokes and assists rolling, while the power face features a gentle concave face to allow a solid catch and reduce flutter on power strokes. This is hands down the finest canoe paddle we have ever used - so much so we have two demo's so Craig doesn't have to let his one out of his sight! Available with Wooden T grip in two sizes - traditional, or new wider grip. The black is sold fully assembled - upon purchase, the Marsport team will be in touch with you to establish the optimum length to suit your chosen craft and help select the most comfortable grip.